Ahab and Jehoshaphat listen to Michiah. “Should you help the wicked,” asked the prophet of the defeated and humiliated king upon his return to Jerusalem, “and love those who hate the LORD?” The prophet was Jehu. The king was Jehoshaphat. The occasion was the aftermath of a crushing defeat inflicted by the Syrians on the allied armies of Israel and Judah. Jehoshaphat was a godly man; one of the few good kings Judah ever had. But in spite of this, he made a major spiritual and strategic mistake in seeking alliance with Ahab, the evil king of Israel. I Kings 22 and 2 Chron. 18 provide the details of the alliance. Jehoshaphat went on a state visit to see Ahab in Samaria, the capital of the northern kingdom. 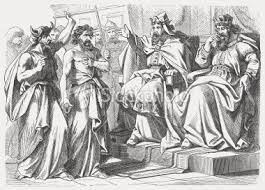 During the visit, Ahab persuaded Jehoshaphat to join him in a grand alliance of Israel and Judah and to make war against the Syrians, all for the purpose of recapturing for Israel territory that had been lost to Syria earlier. In other words, it was an Old Testament version of a crusade against the infidel. Jehoshaphat made several errors that led to his defeat. The first of which was that he, apparently, did not consult the Lord before traveling to Israel to meet with Ahab. The Scriptural record shows no evidence of Jehoshaphat ever seeking the Lord’s counsel as to whether he should go to Samaria. It appears that he did this on his own. Jehoshaphat’s second mistake was not heeding the voice of the Lord when it became clear that the military alliance would end in disaster. The prophet Michiah plainly told Ahab in Jehoshaphat’s hearing that the offensive against Syria would fail miserably. His words were, “I saw all Israel scattered on the mountains, as sheep that have no shepherd” (I Kings 22:17). Jehoshaphat heard all of this, and yet followed Ahab into battle anyway. In all this, Jehoshaphat also managed to serve as Ahab’s dupe. Ahab reacted angrily to Michiah’s prophesy of defeat at the hands of Syria, but he had the good sense to hedge his bets. When Ahab and Jehoshaphat went into battle, Ahab disguised himself, but told Jehoshaphat to wear his royal robes. Jehoshaphat did so, and nearly lost his life when the Syrians mistook him for the king of Israel, against whom they had been ordered to fight. Must Christians Defend the Inquisition? In last week’s post Must Christians Defend the Crusades?, I pointed out a common apologetical error of contemporary Evangelicals. When the discussion turns to the obvious, gross sins committed by the Roman Catholic Church-State during the course of the Crusades and the Inquisition, rather than taking the opportunity to denounce these activities for what they are the evil fruit of the papal Antichrist, too often Christians implicitly or even explicitly defend them. Take for example the following video of Southern Baptist minister Dr. Robert Jeffress on the O’Reilly factor from 2/6/15 program. At about the 2:12 mark Jeffress begins his comments on the Inquisition. Jeffress’ words were, “The Inquisition lasted 450 years; there were 2,200 people who died. That’s about 5 a year. More people died on 911 in one day at the hands of Muslim terrorists than in all of the Inquisition.” In fairness to Jeffress, he is not attempting to argue that the Inquisition was a good thing. But in his discussion with O’Reilly, Jeffress made at least two critical mistakes. First, failed to draw any distinction between Roman Catholicism and Christianity, and thus left Evangelicals on the hook for the sins of Inquisition. Second, he attempted to minimize the evil of the Inquisition, what was one of the most heinous crimes ever carried out by any organization in history. And this was not some momentary slip by Jeffress. In his 2/10/15 interview on Fox News with Gretchen Carlson, Jeffress was even more explicit in identifying Christianity with Romanism. At about the 1:30 mark, he made the following comment, “Christians have done some terrible things in the past, but nothing compared to radical Islam. For example, the President brings up the Inquisition [Jeffress is here referring to Obama’s comments at the National Prayer Breakfast, the same ones he discussed with Bill O’Reilly]. 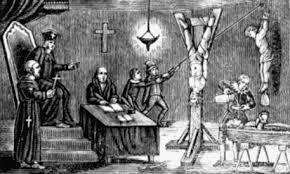 Did you know that in the 450 years of the Inquisition there were about 2,200 people killed. That’s about five a year.” By his claim that, “Christians have some terrible things,” once Jeffress identified the Inquisition with Christianity, thus putting himself and other Evangelicals in the awkward and unnecessary position of having to answer for the sins of Rome. Must Christians Defend the Crusades? 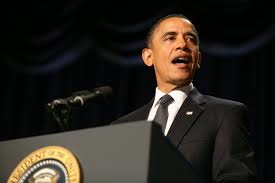 President Obama speaks at the National Prayer Breakfast, 2/5/15. Unless we get on our high horse and think that this [the commission of atrocities] is unique to some other place, remember that during the Crusades and Inquisition, people committed terrible deeds in the name of Christ. In our home country, slavery and Jim Crow all too often was (sic) justified in the name of Christ. This remark was not the whole of his speech, but it’s the portion that has generated the most controversy among conservatives and Evangelicals. For example, Robert Jeffress, a Southern Baptist pastor from Dallas, went on the Bill O’Reilly show on Friday, 2/6 to denounce Obama’s remarks. Jeffress’ comments sought to refute the president by offering that the Inquisition killed only 2,200 people over a period of 450 years, whereas the radical Muslims who perpetrated 911 killed far more in a single morning. Perhaps one could deem this the body count argument. Christians have racked up a lower one than the Muslims, therefore Christianity is the true religion. For the Environmental Protection Agency (EPA), it is not enough oppress Americans with the mere authority of the US federal government. No, it had to go and up the ante by teaming up with the papal Antichrist. Environmental Protection Agency chief Gina McCarthy met with Vatican officials working to draft Pope Francis’ climate change encyclical on Friday, applauding The Holy See for engaging Catholics on the issue. 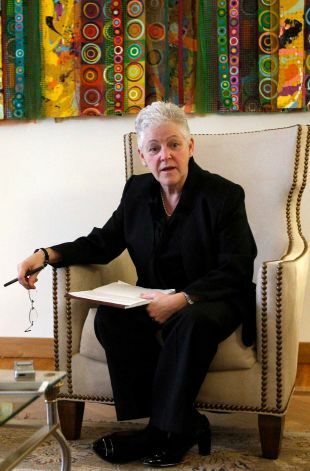 EPA Administrator Gina McCarthy told reporters that her aim in visiting was to show the Vatican how aligned President Barack Obama and Francis are on climate change. The UN globalists have been pushing the bogus man-made climate change meme for twenty years. Of course, during that time, they’ve changed their story. First, it was global warming. When that was exposed as a sham, they simply repackaged their hooey as climate change. Now that the ultimate globalist has joined their crusade against cheap, plentiful energy, economic prosperity and freedom, politicians are quick to seek the blessing of Antichrist to provide cover for them to do what they wanted to do in the first place. This and other trips to the Vatican by high US government officials raises the question, whatever happened to the separation of church and state? Apparently, it depends on what church one is talking about. God help the municipality caught with a copy of the ten Commandments on public property. As one of the plagues of Egypt, the ACLU will be quick to descend upon them with its team of high-powered lawyers all for the purpose of ensuring that never again will the good citizens of said community have their consciences pricked by exposure to the law of God. On the other hand, making a pilgrimage to the Vatican to kiss the pope’s ring raises nary an eyebrow. McCarthy met with [Vatican] officials to discuss working with the U.S. Conference of Catholic Bishops and nongovernmental organizations to put a spotlight on the need for action on climate change, according to a readout of the meeting from EPA. As bishops and people of faith, we do not speak as experts on carbon pollution or on the technical remedies to address climate change. We are pastors in a faith tradition that teaches, as Pope Francis recently stated, “Creation is a gift, it is a wonderful gift that God has given us, so that we care for it and we use it for the benefit of all, always with great respect and gratitude. The best evidence indicates that power plants are the largest stationary source or carbon emissions in the United States, and a major contributor to climate change. Power plants have often been located near low-income neighborhoods and communities of color. Air pollution from these plants contributes to respiratory problems, especially in the young and the elderly.